With a natural energetic ease, Bonnie Carol sings and plays hammered and fretted dulcimers as well as African marimba, bodhrán, folk drums and hand percussion. A performance is likely to encompass traditional music from North and South America, the British Isles, Caribbean rhythms, and even Tex-Mex tunes, all fitting together in that exuberant whole we call World Music. In addition to her solo concerts, Bonnie can be found playing in a Celtic ensemble, and a contra and square dance band. More about each of these ensembles below. Bonnie's music has filled concert halls from New York to Nicaragua for four decades. She is an international ambassador for peace in the most artistic sense, a visionary from the high country of Colorado. She has an arresting natural charm, extraordinary talent and energy, acres of instruments and mountains of talent. Bonnie possesses professional credentials that are some of the most complete in the industry. She has produced, recorded, and distributed half a dozen recordings of her music, on which she plays the majority of the instruments and is currently working on another CD. 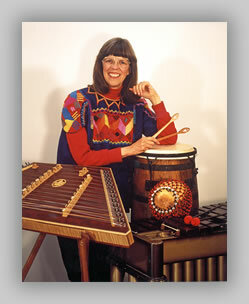 She put her knowledge of traditional music, dulcimers, and African marimbas into the dozen books she has authored. 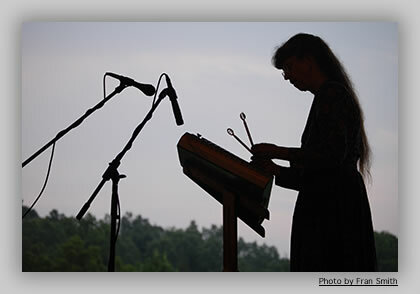 Most of the dulcimer contests across the nation have seen Bonnie win or place. See for yourself - attend a performance or arrange for her or one of her bands to play at your event. Bonnie's decades-long association with the stellar musicians of the Colorado acoustic music scene allows her to put together the perfect, individually tailored, solo or ensemble presentation. Get in touch and let's see what can be dreamed up to fit your event and budget. Call (303) 258-7763 or E-mail. Bonnie appears solo or in ensemble at festivals and concerts world wide, and plays music from her current bag of tricks and interests: just now that is Celtic and American traditional music, music she composes, and music from Latin America. But, look out, she is working as a studio musician on music from Lithuania - who knows what's next. “I’m so glad I got to know you at last week’s Bayou Festival. You are such a positive person. That’s great energy that radiates … you are a real musician in every sense of the word: talent, personality, generous with sharing the stage, confidence and grace. You were a big part of why the festival seemed to work so well. “ Denise Guillory, co-organizer of Bayou Festival in Louisiana. “Again and again, THANKS, MERCI, DANKE, ¡GRACIAS! You have been Colorado’s soul of dulcimer for so long, I’m honored now to be part of this state and tradition. “ Steve Eulberg, Colorado State Dulcimer Festival organizer. A live caller / dance teacher and band teaches you and your friends to dance American community dances such as the Texas Star, Waltz, Schottish, or Virginia Reel. Great fun and good for introducing strangers at weddings and parties. This can inlcude Bonnie solo on hammered dulcimer, or Bonnie with other musicians on fiddle, guitar or piano. It's beautiful, elegant music during the marriage ceremony as well as for receptions, and parties from formal to fun. “Thank you for joining our wedding ceremony … the music blended so well with the rest of the goings on - I was filled with romantic and happy dreams…the dance music made me feel alive and really in the moment. I’ve grown up hearing your music and it was so moving to have you playing at my wedding. “ Don and Yoshi Souder.